–> Judge Nyirenda: Now I proceed to determine the issue. I will look at the law conferring power on MEC. Then judge analyses the law. –> Judge Nyirenda now on topic of extension of results. –> Juge Nyirenda: Now I move to the 2nd issue: whether the 8 days can be extended. 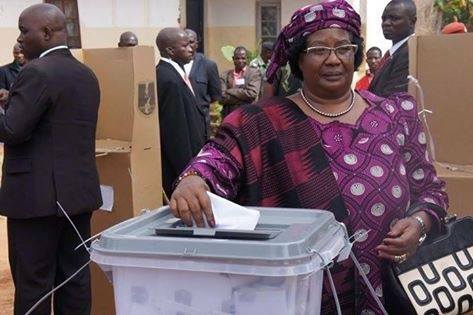 –> Malawi Electoral Commission to recount votes in a disputed poll, the High Court has just ruled. –> Judge Nyirenda analyzing submissions made by both parties on extension of the 8 days -for and against. –> Judge Nyirenda quoting sec. 99 with regard to publication of results within 8days.–> Judge Nyirenda now about to make his determination. –> #malawielections2014 high court judge rules results have to be announced tonight. Malawians wait for official announcement from MEC. –> BREAKING: No extension has been granted. –> Distraught. MCP camp at National Tally Center. –> DPP supporters celebrating outside the court & at the Tally Centre chanting “wakwiya ndi mfiti, Peter boma!!!”. Too soon to celebrate?